Posted on Fri, Jan 20, 2012 : 4:21 a.m. I picked up a rotisserie chicken and baguette and thought this classic Italian salad would be a great accompaniment. It's cold out there so I prefer my salad warm. But of course you don't have to sauté the greens; simply follow the recipe skipping that step and make a vinaigrette with the olive oil, vinegar and garlic. I served this with a rotisserie chicken, purchased from Whole Foods deli. 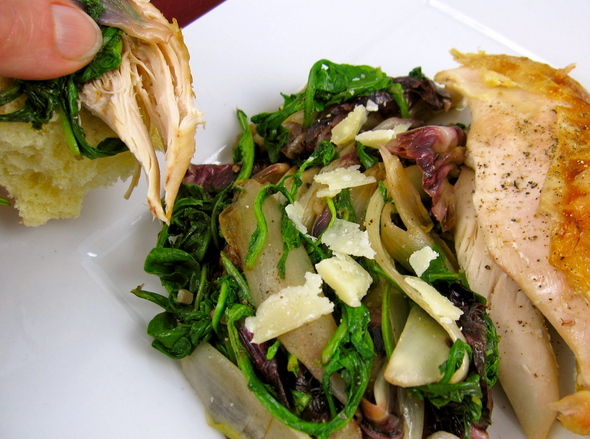 I especially enjoy loading the chicken and greens onto a piece of crusty, freshly baked bread. 1. Wash the radicchio and arugula, tear into pieces and gently dry in a salad spinner. Rinse the endive and pat dry with a paper towl. 2. In a large sauté pan, heat olive oil over medium heat and sauté garlic until fragrant, about 1 minute. 3. Add raddichio and endive to oil and saut&eacuate;, with a pinch of kosher salt, 2 minutes, stirring. Add arugula to pan and sauté until just wilted. Toss with 1 teaspoon balsamic vinegar, adding more to taste, if desired. Top with freshly ground pepper, Parmesan and serve.